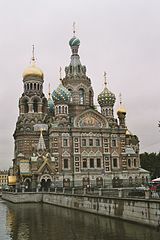 Bloody Church or Church on Spilled Blood is a famous church in St. Petersburg. The original name of this church is Cramps Spasa na Krovo. Judging from its shape, is not much different from the Church St. Basil, Moscow. Modifications were made, lies in the model inlay on onion dome above. The architect, Alfred Parland, honestly admitted that this creation was inspired by St. Basil Church which is already well-known in advance. The term originated from the blood of the church standing history, the death of Alexander II in a bomb attack unknown person in 1881. The departure of the king made Prince Alexander III is very sad. To perpetuate the events, he ordered to build a church exactly where the father died. Once development takes a long time, eventually the church was opened in 1907. Unfortunately, with the change of government becomes sensible communist Soviet Union, this beautiful church was closed by Stalin in 1930. The condition of the church after it very worrying, not groomed and partly damaged by World War II. Only when times change, the church can still function as normal, plus become tourist attractions for the tourists. Dengue is not only the beauty of the Church visible from the outside. On the inside, the various religious mosaic panhandle story proselytizer floor up to the roof which will be calculated when measuring 70000 square feet. Carved stone and various shades of gold leaf adorn the walls, the floor is made of marble church accidentally imported from Italy, while the altar is made of precious stones. In addition, various paintings decorate the entire room. Bloody Church entrance ticket is about 300 rubles. In order to achieve this Church, you can use the Metro and Nevsky Prospect exit.